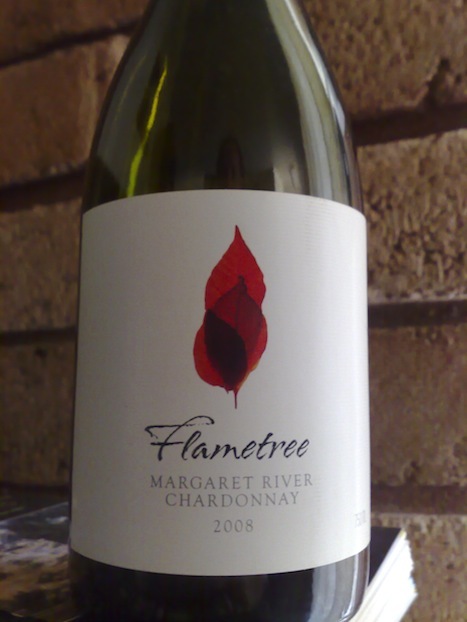 Flametree rocketed to fame by collecting the Jimmy Watson Trophy at the Royal Melbourne Wine Show in 2008 for their 2007 Cabernet Merlot. The fruit for that wine, and most others during the time, was purchased from around the traps and made under contract at Happs Winery around the corner. With a winery and cellar door complex now built in Dunsborough at the northern end of the Margaret River wine region, Flametree can take a bit more control over the winemaking process. Cliff Royle has joined as GM and whilst he doesn’t get his hands dirty in the winery I’m sure he knows what’s going on in there. Young gun Julian Scott looks after the day-to-day in the cellar. No vineyards are owned so fruit is still purchased in. This bottle was another leftover from the random BBQs over the summer holidays. The colour is richly golden and invites, seduces even. I’m a sucker for a golden chardonnay. The nose is slightly volatile, but unworryingly so. Get past that and there’s classic Margaret River chardy scents of cashew and fig, grapefruit and melon, with a healthy dose of yeasty bread. It opens further to reveal citrussy lemon rind and pear and a generous whack of creamy oak. It smells warm, but the alcohol says only 13.5%. A smooth ride on the palate, the acid has been backed off a little. Texture is king here and the flavours of lemon and orange zest meld effortlessly with white peach, nectarine and sweet honeydew melon. Figgy and nutty still, toasty and warm, although the alcohol not so obvious now. It surprised me. I liked this wine more than I expected. As I said, I’m a sucker for good Margies Chardy and this one is pretty smart in an unpretentious way. It aint trying too hard to be something special, but somehow manages to hit my good-vibe buttons. Enjoyed a glass on its own on the deck, but finished it with some duck and noodles. Value: Retails for $28 at CD – a bit pricey perhaps for a simplish style. But with a JW in the cabinet you can add a few bucks to everything I suppose. Region: Margaret River. No idea of fruit supply for this wine, so no soil type available. Vintage: 2008 was an excellent year in the region, following on from the superb 2007. The 08’s tended to have a little more structure in both whites and reds – a little firmer and robust, without losing that general elegance of Margs. Probably the 08's will outlive the 07's.